Gabriel Monnier won the French Figure Skating title in 2001 after finishing second in 2000. France’s Gabriel Monnier marches to the beat of a different drum. When he skates, Monnier does not play the comic like Laurent Tobel nor the swashbuckler like Philippe Candeloro. “One of my favorite skaters was Petr Barna. Even if he was not one of the best skaters of his generation, I like his precision and style, in the jumps and in the choreography,” he stated. Monnier emulates that style. Monnier won the French Nationals in 2001 after finishing second in 2000. “Winning nationals is for me a big thing because, as usual, I had a lot of injuries this year,” he stated. Now he’ll have the chance to compete at Europeans and possibly the Worlds and the Olympics, depending on the results from Europeans. 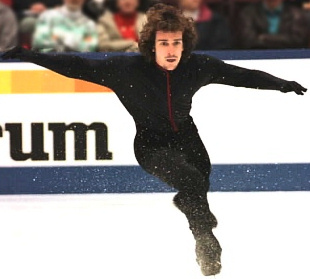 Monnier started skating when he was about five years old, becoming serious when he was nine. “I started because my older brother and sister were skating in the rink that had been built just in front of our apartment,” he recalled. “They used to skate for fun.” By the time he was 12, Monnier had landed his first triple jump, a triple salchow. For the last 14 years, Monnier has worked with a team of coaches including Pierre Trente, Annick Gailhaguet, Diane Sckotnicka, and Li Ping. Because he is a university student studying biology, he only practices 14 hours a week on ice. “I’m studying biology because I’ve always been interested in understanding the comportments of animals. That’s what I would like to study, but I’m not yet in the level,” he said. Off ice, he works with Mustapha Aakik doing physical conditioning about four hours a week. “I sometimes do the choreography for some exhibitions but not for competition programs,” Monnier stated. Martial Jaffredo, who formerly competed in ice dancing with Dominique Deniaud, choreographs his programs. To select the music, he said, “I listen a lot of music and suggest them to my choreographer and then to my coach, or they suggest one to me and we decide together. Most of the time I like to skate to dark or sad music, deep that’s where I feel the best.” His past programs have included music from “The Crow”, “The X-Files”, “Rangoon” and “Dark City.” “I think I have to change this year because I want to discover something else in the music and in me,” he said. Although he kept his Dracula long program, he changes his technical program to use “Charms of the Night” by Dale Douglas. Monnier listens to a lot of music for relaxation, almost everything but rap and techno. His favorite bands used to be Led Zeppelin and the Cure but he doesn’t have particular favorites anymore. He also plays the guitar. He used to read a lot of science fiction when he was younger, especially Frank Herbert, Isaac Asimov, and Orson Scott Card, but now prefers to read French authors such as Philippe Djian, Boris Vian, and Alexandre Vialatte. He doesn’t watch many movies but enjoys talking about the work of directors such as Tim Burton, Stanley Kubrick, David Lynch, and Danny Boyle.